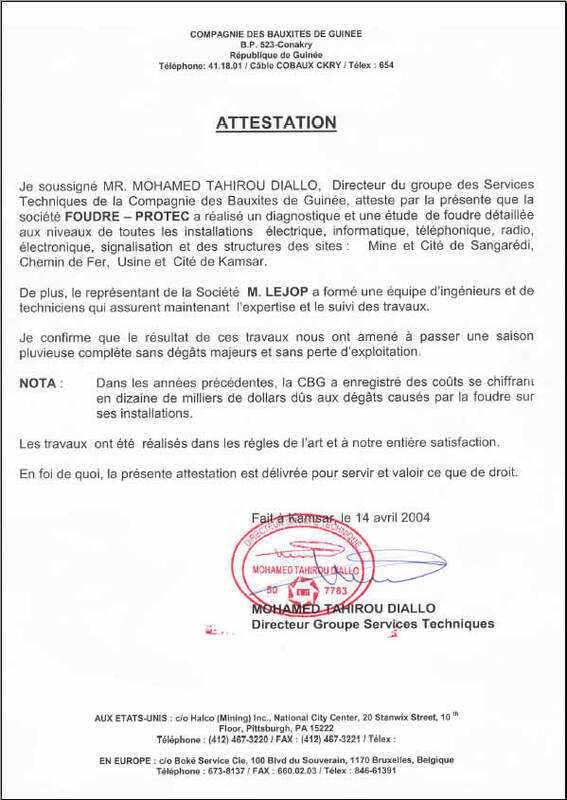 I, the undersigned Mr. MOHAMED TAHIROU DIALLO, Director of the Engineering Departments Group of the Bauxites Company (Guinea), attests by the present that the FOUDRE-PROTEC company carried out a diagnostic and complete lightning protection engineering covering all the electrical installations, data processing, telephone, radio, electronic, railway signalling and structures of the different sites: mine and Sangarédi city, railway, plant and Kamsar city. Moreover, the representative of the company Mr. LEJOP trained a team of engineers and technicians who now ensure the expertise and the follow-up of work. I confirm that the result of this work led us to spend one complete rainy season without major damage or operating loss. N B : during the previous years, the CBG experienced costs up to several tens of thousands dollars due to damages caused by lightning strokes on its installations ; Work was completed according to good practice rules and meeting with our total approval. In witness whereof, the present certificate is delivered with all advantages thereto pertaining.